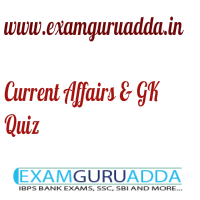 Dear Readers Examguruadda.in presents Current Affairs quiz of 25-26 November 2016 that cover important current affair events. Current Affairs quiz prepared according to the latest Bank, SSC and other competitive exam. 1. Which Indian actor won the Best Actor Award at the 10th Asia Pacific Screen Awards? 2. The Constitution Day is celebrated on which date in India? 3. Fidel Castro, who passed away recently, was the revolutionary leader of which country? 4. Who will be conferred with the Legends Award by International Boxing Association (AIBA) on its 70th anniversary? 5. The book “Banaras City of Light” has been authored by whom? 6. Who took charge of Hockey India as its president? 7. The Fifth International Tourism Mart for the North Eastern Region was formally inaugurated in .....? 8. Who won inaugural Qatar Ladies open Golf? 9. Who was appointed as the Chairman of the National Highways Authority of India? 10. The Palampur Assembly Constituency that became the first e-Assembly constituency of India lies in which State?